This quilt caused quite the quandary…is it Gingham, or is it Buffalo Check??! Oiy. I wasted a good 15 minutes of my life with my good friend Google trying to figure it out. In the end all I found out was Buffalo Check was a bigger version of Gingham…so I’m calling this quilt pattern Gingham because it sounds cuter than Buffalo Check. Eventually the baby will share a room with Sophie, so I stuck with coral colors that match the quilt I made for Sophie’s bed . 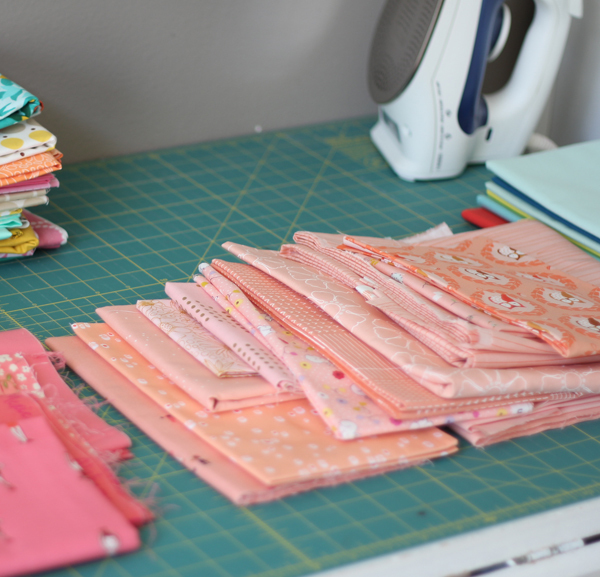 I picked my solids first since they are the majority of the quilt, and sprinkled in a few prints here and there. This little quilt measures 38 1/2″ x 45 1/2″, and I cut my squares 4″. If you want to make a Gingham baby quilt like this you’ll need 143 – 4″ squares (42 dark squares, 71 light squares, and 30 white squares). Thanks for all the input on my gray walls in my last post.…you were almost exactly half and half! My husband saw my post and let me know I’m prohibited from painting anything until I’m out of my crazy-pregnant-lady-nesting faze. cute cute quilt, and a very wise husband. Oh, that is so adorable – love it with the prints sprinkled in the solids. A (ahem) “buffalo” check gingham has been on my to do list… Sweet! I love this so much! I have actually wondered about Buffalo check vs gingham myself – I thought maybe the buffalo was for larger scale ginghams? Anyway, love your blog – I just sewed my first ever quilt and it was your Strip and Flip! 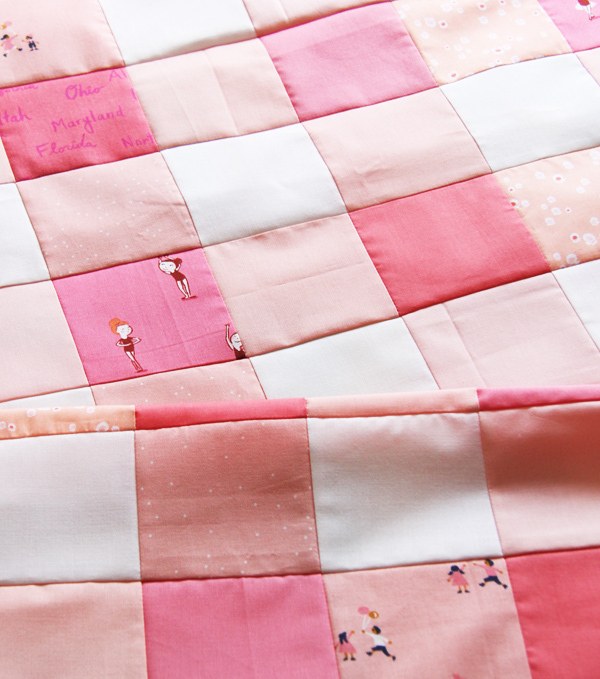 Would love to make this quilt for a friend having a baby girl in May. Would you mind sharing not the solids colors that you used? The darker coral color is Bella Solid by Moda in Tea Rose I believe…it’s one of my favorite colors I’ve had for awhile (I also like just the rose color). The salmon color is a Cotton and Steel solid called Salmon. Moda also makes a nice light coral but I don’t remember the color name sorry! Thank you! Love this quilt!!! I’ve learned something new…I didn’t know what Buffalo check was. It’s beautiful! Dear Allison, Your gingham quilt is absolutely lovely. What a brilliant idea. Thank you for sharing it with us. Also, congratulations on the upcoming addition to your family. Best wishes the future. Thank you Deb! Have a wonderful day! Please use your signature aqua in the binding, love! So so sweet. I missed that wall color…repeat please? Thanks. Gingham always leaves me with a warm, cozy and homey feeling! 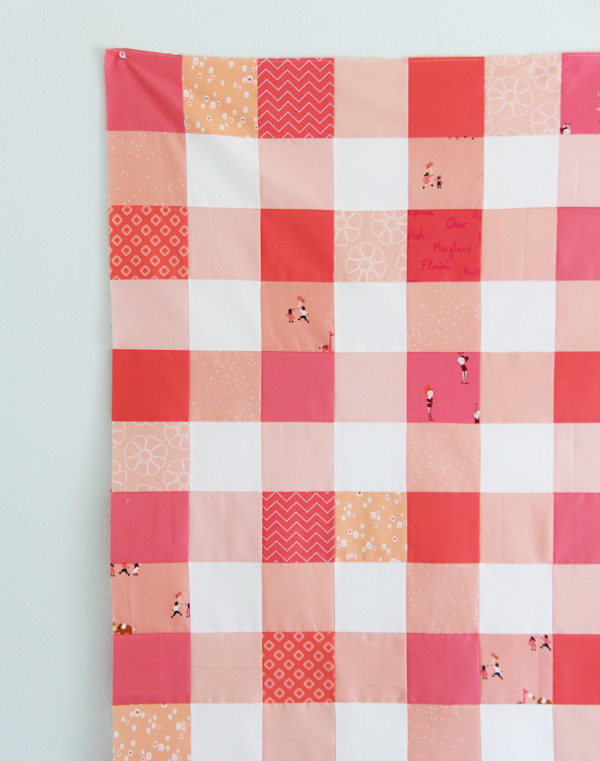 Love your coral baby quilt for your ‘new’ addition :)! 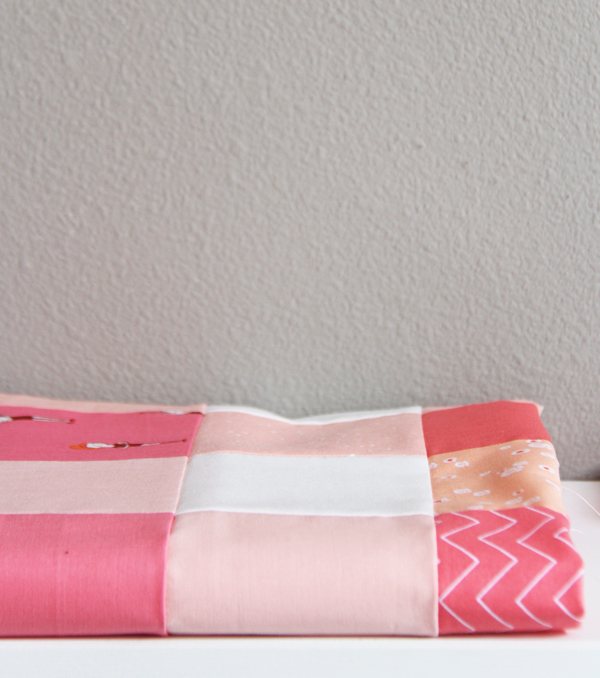 Love this quilt and your coral fabrics! So sweet for your daughter and so nice it’s not the usual pink. Cute, the print squares set it off. Husbands are dear! 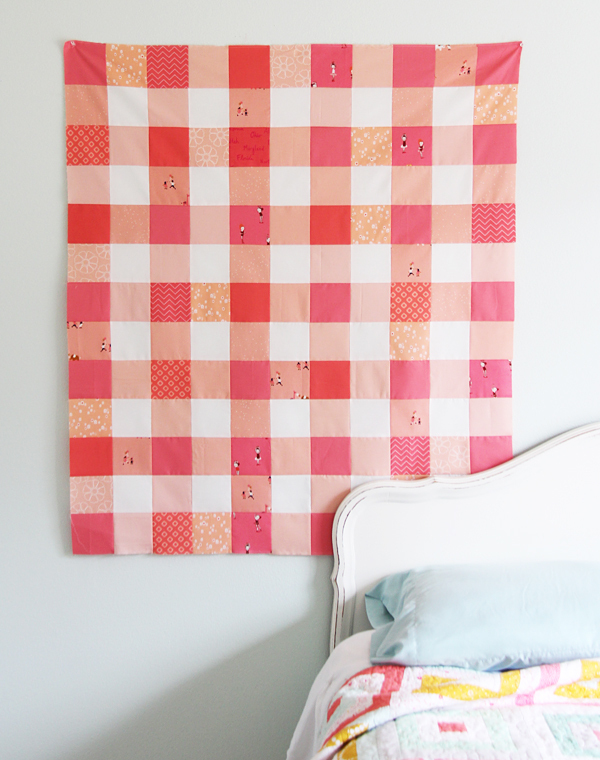 Love the simplicity of this darling little quilt – especially your color choice. Jay is a good man! I love the gingham and the use of small prints gives this a very special, personal touch. Thanks for the measurements and numbers of each color. As a novice, this really helps to get a feel for “how much makes what size” in general. For your future painting decisions, I love your gray walls! We recently moved and I used Valspar Gravity (a light gray) in my family room that flows to my kitchen/breakfast dining that we (meaning my husband) painted in Glacier Mist. The blue brings out the gray, even though it is a lighter shade. I love it! Very peaceful and it goes with everything! Congratulations, and happy times with your new baby! Such a sweet mom to make your older son a new quilt before starting this one for the newest addition to your family! you da man, errrr, woman, artist, creative genius !!!! Why, oh why are there so many cute quilt ideas out there? My head spins with the possibilities. This one is Brilliant. Lucky baby! This is the sweetest color and fabric combination Allison! It looks wonderful with the solids and scattering of prints. Gingham does sound better than Buffalo check and I say that as a Buffalo NY gal. Your quilt is just yummy. So simple and quick, but the colors are beautifully put together. I can relate to the “crazy pregnant” label. When I was carrying my firstborn, I painted my bathroom “Pepto Bismol Pink” and called it “Pink Canada Mint”. It changed shortly after my son was born LOL. No matter what you name it, it’s such a beautiful color! So cute. I may have to give this a try! So sweet!!! Thanks for sharing how you made it too! I want to make this. It is reallly cute. Oh, that is so cute! I want to make one. Congrats on your pregnancy. How wonderful that your having a little girl. Cant what to see the newborn pictures. When are you due? I love how you mixed in just a few sweet prints. Very sweet baby quilt and CONGRATULATIONS on your growing family! Hello, love the sweet baby quilt. Especially love the print fabric(s). Would you share the name of the fabric. Hi Judith! The ballerina print is by Heather Ross from a line called Tiger Lily. The one with the tiny kids and balloons is a Cotton and Steel print called Penny Arcade I believe. The light coral floral (outlined white flowers) is my own fabric from my Hazel line for Windham Fabrics, the light coral sprinkle print is from Cotton and Steel sprinkle line (purchased at hawthornethreads.com along with most of these). I can’t recall the others! This is so cute. I absolutely love this. I like the way you included some prints. I have pinned this to my Gingham Pinterest board. Love this quilt! I’ve pinned it so I won’t forget it as a possibility for a Project Linus Quilt! I just love the color combination. Wish I could buy these colors all together in one layer cake! I absolutely love looking at your quilts.